Nitra is a city in western Slovakia, situated at the foot of Zobor Mountain in the valley of the river Nitra. Visit SNM - Bojnice Castle Museum and Old Castle Banska Stiavnica for their historical value. Get in touch with nature at Arboretum Borova Hora and Driny Cave. Explore the numerous day-trip ideas around Nitra: Trnava (Malá synagóga - Gallery, Church of St. Helena, & more), Banska Stiavnica (Open-Air Mining Museum (SMM) & Sitno), Bojnice Zoo (in Bojnice) and Cerveny Kamen Castle (in Cerveny Kamen). 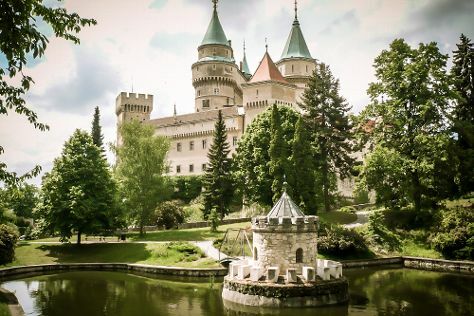 Next up on the itinerary: explore the historical opulence of Nitra Castle, test your problem-solving skills at popular escape rooms, stroll through Park na Sihoti, and pause for some serene contemplation at Church of St. Michael the Archangel. To find ratings, reviews, traveler tips, and more tourist information, you can read our Nitra travel planner. Use the Route module to find suitable travel options from Vancouver, Canada to Nitra. Due to the time zone difference, you'll lose 9 hours traveling from Vancouver to Nitra. Expect a daytime high around 12°C in March, and nighttime lows around 1°C. Finish up your sightseeing early on the 23rd (Thu) so you can travel back home.